Need to build a quick new one-page website? Don't spin up a WordPress site—all you need is the new Google Sites, and 5 minutes to put the site together. Google Sites has long been a simple way to make sites, most commonly used for education sites and internal intranet sites. The latest version isn't perfect—you can't add your own domain, for starters. But it's incredibly easy to use, packed with hidden features that just might make it the best way to make a quick website. 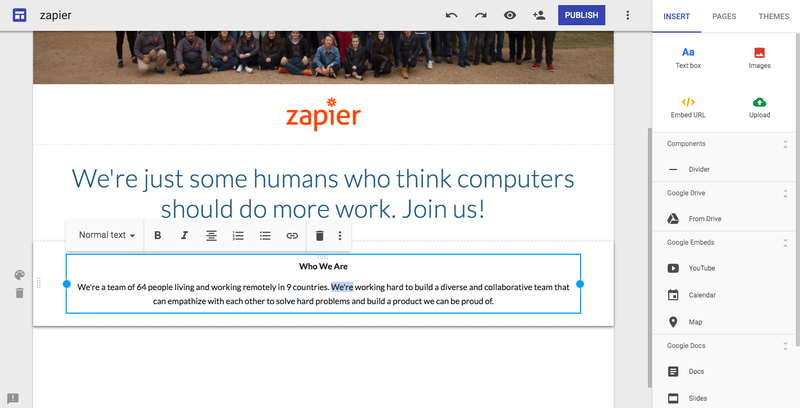 Here's how to build your next site in Google Sites—complete with a tutorial of how to recreate Zapier's About page in Google Sites. Ok, ok: You wouldn't want to share everything in your Gmail and Google Docs accounts even if you could. Even company apps need some privacy. But for all their great built-in sharing and collaboration features, the best teamwork and sharing options in Google's apps are often hidden. Even if you have a paid G Suite account on your own domain, your team won't have a shared calendar, address book, or file library by default. You'll instead need to set that up on your own. Here's G Suite's best hidden sharing features, with ways to set team email signatures, email your whole team at once, share Google Contacts, make a company-wide Google Calendar, and share files and Google Docs document templates. Ever wondered if you'd work better in a cave, without a phone signal, internet access, TV, or anything else to distract you? Perhaps you write the next great novel, or invent the next big thing. Or at least, you might quit reaching for your phone at the first hint of boredom. It's hard to do your best work in our distracted world, harder still to focus only on what's most important. And so, author Cal Newport in one of 2016's most popular business books argues the virtues of what he calls Deep Work. With academic data and real-life examples, he teaches the value of focused work—not hard work with long hours of overtime, but a dedicated part of your day where you work at your fullest. On the flip side is another of 2016's most popular books, Messy from author Tim Harford. It sings the praises of messy desks and chaotic workpaces, of the benefits of strikes and misplaced instruments. It reminds us that genius doesn't appear in a vacuum, that it requires a spark to bring it to life. And that spark so often is the messiness of life. Opposites, yet so similar. Here's what I learned from both books—and how you can apply their lessons to do messier, deeper work this year. A new year, and time for another new book from the Zapier team. This time, we've researched what you need to do to start a business, tested over 50 eCommerce apps to find the best, and detailed step-by-step what you need to do to start your first eCommerce store. We even found ways for you to accept payments from anywhere around the world, even if your customers don't have credit cards. 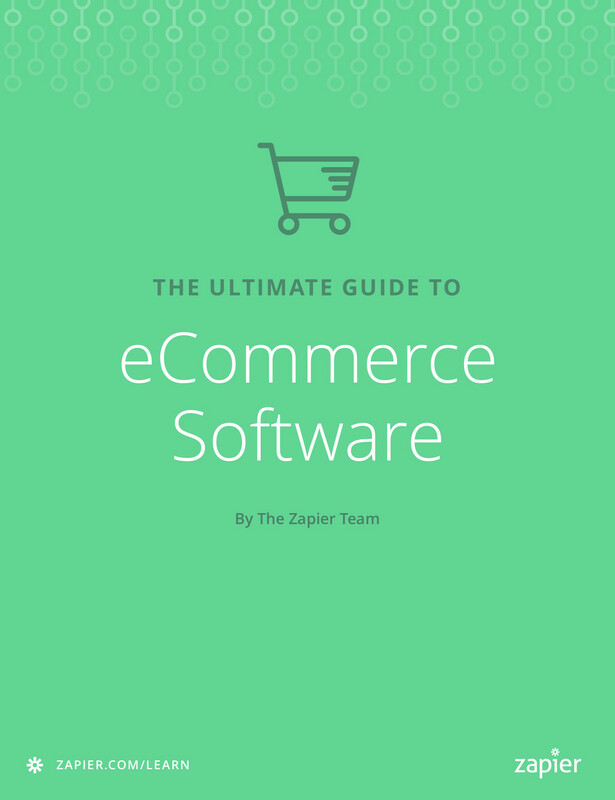 It's The Ultimate Guide to eCommerce Software, and it'll teach you everything you need to make your first—or 50th—online store a success. Download a free copy today and start turning your dream into the next business success. It's always difficult to authoritatively state "This is the best app for X" when there are so many different apps available. And while it's somewhat easy to guess which apps are the most popular, based on App Store downloads and general tech news buzz, it's a bit harder to say with certainty which apps are actually being used the most—the ones that bring the most value. And so, at Zapier, this year we looked at which of our 750 apps grew in usage the most in our automated workflows. There are two lists: One with the fastest growing existing apps, and another with the fastest growing new apps. The former are tools you've likely heard of—ones you definitely shouldn't ignore. The latter are the new apps that are quickly becoming popular, the ones you should be trying out. Here are the apps you should be using. Ever thought of starting your own online store, but weren't sure where to start? Here's where to start. In this step-by-step guide, you'll learn everything you need to build a new Shopify or WooCommerce store for the best tools in a hosted or self-hosted online store. It's the guide you need to start selling your products online, in your own store. You want to start an online store. You know what you want to sell, and already have a name picked out for your store. All you need to do is figure out what tool to use to build your store. You shouldn't code a store from scratch unless you really know what you're doing. Instead, you're best using an eCommerce platform, either one that lets you build a store online or a self-hosted eCommerce tool to customize the way you want. You just need to choose the best one for your needs. Ever wondered what makes Shopify different from WooCommerce, whether Big Cartel would be perfect for your small store—or if Gumroad would be enough—here's the data and reviews to help you make your decision. Selling stuff online doesn't have to be difficult. You could customize an eCommerce store on your own server—or you could just sell stuff directly with a form. You could launch a new product with a Kickstarter crowdfunding campaign, then sell it directly with a simple Gumroad store, and eventually cross-list it on Amazon and your customized store. There are tons of options, each one a good choice for a specific type of store. Here's the details about the best ways to start an online store that you need before selling your new products online. Starting a store used to require bricks and land. Sharing your opinion required a newspaper. Streaming video needed a TV station. The internet's changed all that. Sharing your opinion only takes seconds—and sharing a video only takes a bit longer since uploading videos takes longer than publishing text. And selling stuff? You can sell your old iPhone—or start a full store—with just an account. There's only one small complication: accepting payments. Money is still harder to move around than plain bits, and even if you sell stuff on eBay you'll still need a separate PayPal account for payments. But wait: could you use Stripe? Or would Braintree or Recurly be a better option for your store? Our latest app roundup answers that. Here's the best online payment services—and what makes each great. Spreadsheets are powerful tools, ones that used to require installing a full Office suite on your computer. Today, they're a commodity, with free spreadsheet tools on almost every platform. The original spreadsheet app that most of us started out with—Excel—is still one of the best, though. It includes more functions and tools than most other spreadsheet apps, and its wide range of add-ons make it an incredibly powerful tool. And now, it's free too. Excel Online is slimmed down version of Excel that runs in your browser, yet still includes the core features you need to crunch numbers. It supports 468 functions—all but 3 of the functions included in Excel 2016 for Windows—along with charts, formatting tools, and more. And, with add-ons, you can even add extra features to make it closer to desktop Excel. If you've never used Excel before, or just are curious about what the web app version offers, here's the guide to Excel Online you need. It walks you through every feature included, so you can make spreadsheets, surveys, reports, and more right from your browser for the low price of free.